…what, again? Oh, no! When is that little shepherdess ever going to learn? It sounds like she might need to be replaced by someone who can do a better job, and it had better in time for Halloween. Because everybody’s really tired of going out searching for sheep…and all that waiting for them to come home, wagging their tails behind them, is getting petty old. So, do you know anybody who loves nursery rhymes, soft and fluffy animals, and dressing up all fancy? Anyone who kind of loves being in charge? We thought so. We also think your little girl would be able to step into that favorite nursery rhyme this Halloween so sweetly and so perfectly! 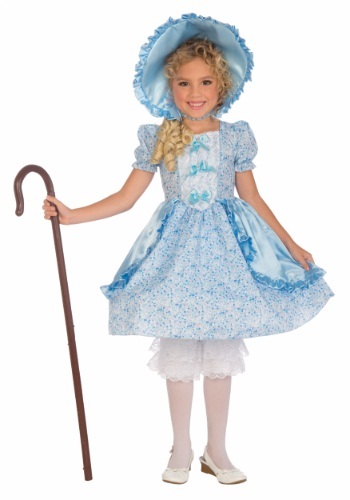 And we’re here to help her do it with this Li’l Bo Peep Child Costume. Because she has to look the part if the sheep are going to listen to her at all. The bonus is that she’ll look extra cute in the costume, too! This costume’s little calico dress has pretty, blue satin accents to update the country look with a little bit of shine. Your girl will love leading her followers around while wearing the hooped skirt that’s just like all those ladies wore in the olden days. The white, ruffly pantaloons underneath fit with elastic so they stay on while she’s out doing her job shepherdessing. The matching, blue satin bonnet ties under the chin and tops off the look. All she needs is a hook (a big cane will do fine), and she’s ready to charm everybody in the pasture.